A porous filter having an average pore size of 10 microns was placed in a vacuum chamber and vacuum was pulled to less than 1 mmHg. Water soluble oil was brought into the chamber to submerge the filter. The chamber was brought back to atmospheric pressure and the filter was weighed to an accuracy of 1 mg.
Two filters were cleaned in a surfactant solution for two minutes, one in the VCN process and the second one in a 40 kHz ultrasonic bath using 100 watts/gallon energy. The results are shown in the graph below. 11” long, 0.2” diameter tubes were filled with mineral oil and drained to coat the inside of the tubes with an average 0.25 mg/cm sq. weight of oil. 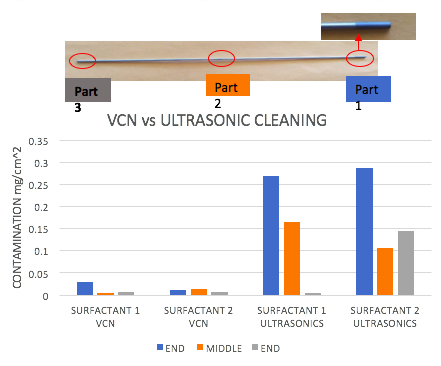 Two tubes were cleaned in a surfactant solution for two minutes, one in the VCN process and the second one in a 40 kHz ultrasonic bath using 100 watts/gallon energy. The remaining oil was measured using A total carbon analyzer. 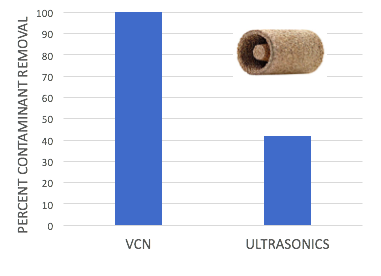 The results for three different locations in the tube as shown in the figure are shown in the graph below.